It is a huge task to get a ‘payer’ to seriously consider a new idea or solution, however, with the right approach, almost anyone can be persuaded to re-think a situation or re-appraise their opinion. The secret is in breaking down barriers and overcoming their anxieties. We all put up barriers based on deep-seated hopes and fears as a result of past experiences. When confronted with new ideas, it is much easier to say “no” than to dive headfirst into the unknown. To overcome this natural resistance to change and make our audiences receptive to new ideas, we need to understand their hopes, fears and experiences. In short, people respond to anyone that they believe genuinely understands their needs and wants to help them. As convenient is the title may be, in reality there is no such thing as a ‘payer’. Commissioners, decision makers and those that sit on formulary committees, generally retain their root job titles: GP, Pharmacist, Manager, Clinical Lead etc. They started in healthcare to make a difference. It was a calling as much as a career choice, that’s why, even when they move into high-level managerial roles, they retain their healthcare identity. ‘Payers’ are people who care about other people, and as such, we need to adapt the way we approach them. A great product or innovative idea is not enough. We need to understand our audience and help them to overcome their fears so that they feel comfortable enough to embrace change. Decision makers are naturally averse to anything new. They fear failure and need buy-in from their team before even considering stepping outside of their comfort zones. As the saying goes, “if it ain’t broke, don’t fix it”. So, we must take a more creative and agile approach when trying to connect with those that hold the purse strings – or their advisors. If we really want them to shift their perceptions, to change their beliefs; we need to identify new information and deliver it in a way that resonates with them. We need to talk on their terms to dispel their fears and deliver insights and solutions that appeal to their hopes and dreams. 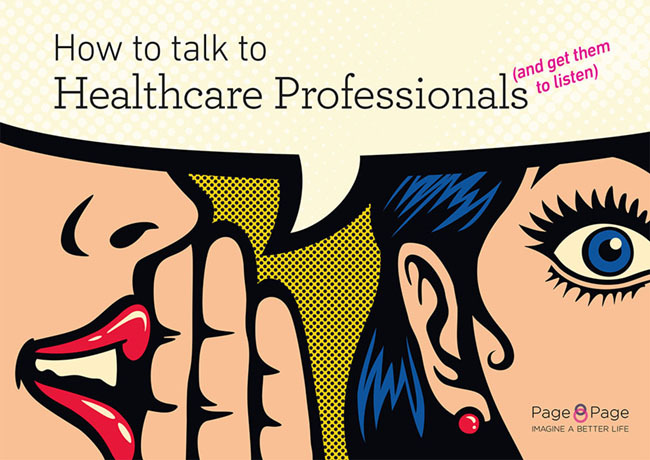 Follow this link to download https://pageandpage.uk.com/how-to-talk-to-healthcare-professionals which sheds light on how to talk to customers – and more importantly, get them to listen, so you know you’re speaking the right language.